File image of bivalve shellfish. Officials with the California Department of Public Health issued a warning on Friday to consumers to avoid eating rock crabs from Half Moon Bay and bivalve shellfish and rock crabs from Monterey Bay. Dangerous levels of a toxin called domoic acid have been found in rock crabs and bivalve shellfish such as oysters, clams, mussels and scallops. The warning is in effect for state waters south of 37 degrees 11 minutes north latitude to 36 degrees 35 minutes north latitude, according to health officials. That's an area roughly between Pigeon Point and Cypress Point in Monterey County. The advisory covers rock crab caught recreationally or commercially and recreationally caught mussels, clams and the internal organs, or viscera, of scallops, health officials said. Rock crabs caught in Half Moon Bay showed domoic acid levels in the internal organs of more than 10 times the level that requires the action to be taken. The action level is 30 parts per million. Portions of Half Moon Bay north of Pigeon Point are still under a fishery closure, but the higher levels of domoic acid detected in the rock crabs in Half Moon Bay and the crabs and shellfish in Monterey Bay raise concerns about the bivalves and crabs caught throughout the whole region, health officials said. The warning excludes clams, mussels, scallops, or oysters sold through harvesters and dealers who are state-certified. The shellfish sold by these dealers and harvesters are tested for toxins frequently. 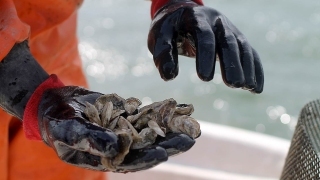 Symptoms of mild cases of domoic acid poisoning include vomiting, diarrhea, abdominal cramps, headache and dizziness, all of which usually disappear in a few days, according to health officials. In severe cases a person may have trouble breathing, be confused, disoriented, have seizures, excessive bronchial secretions, cardiovascular instability, permanent loss of short term-memory, go into a coma or die. So far no one has reported becoming ill from the crabs or shellfish caught in the area, health officials said. Domoic acid was behind the closure of much of last season's Dungeness crab fishing, which didn't start until May, causing an estimated $48 million in losses to the industry, state officials said in February. Dangerous levels of domoic acid affected rock crab fishing earlier this year. Updated information about shellfish poisoning and quarantines can be obtained by calling the health department at (800) 553-4133.